>not, they can keep ranting. I think that the robust discussion has been good, and I have appreciated the debate points raised on both sides. I would like to think I am open minded enough to allow for other possibilities. It would be great news if GW is over-exaggerated(! ), and I don't think our main defenders of that position are evil incarnate for standing up for it; but I know I am conservative enough to act 'just in case' from a moral perspective. I doubt I am the only one inclined to fence-sit for a bit. >>Does anyone, apart from Tones or RJ, believe their arguments at all? >I would like to think I am open minded enough to allow for other possibilities. I won't hit you with any further argument it this stage. I was probably thinking along the same lines at one stage, and after seeing Gore's movie, I wanted to find out if science backed up his claims. I therefore suggest you think of the questions you want answered, then do some research for the answers - not just the media. If you can, get as close to original data as possible and do your own evaluation. I could give you a set of questions, but it's best if you do this yourself, so there's no bias. Hope you can do this, and best of luck with it. >there's no bias. Hope you can do this, and best of luck with it. This is the nub of the flaw in the sceptics argument. What raw data do you propose getting that will help you understand the whole climate system? Particularly given that it's a multivariable, entirely non linear system? Not only do you propose that the thousands of scientists that are trying to do this are wrong, but that you know better than them! Why have you chosen climate as the topic to try and take out of the hands of the experts? Why not economic policy? Or trade? >>do some research for the answers - not just the media. >you propose getting that will help you understand the whole climate system? You may choose to complain about the source of these. They are just easy to access - the same plots are readily available from lots of reliable sources for those who want to check. 3. You can access lots of other data - Arctic and Antarctic ice area, atmospheric temperatures and various levels, CO2 concentrations all over the world etc. Looking at these can't help but raise some serious questions, and unfortunately I, and many scientists, are not getting the needed answers. 1.The temperature increase rate from 1910 - 1940 was the same as 1970 - 2000, even though there was no significant anthropogenic CO2 at that time. 2. 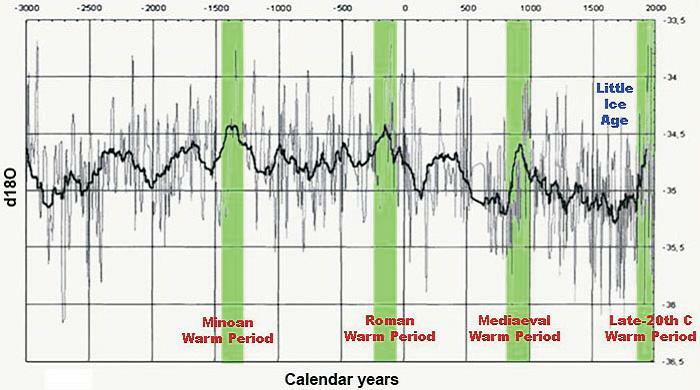 There is nothing unusual in our current temperature changes based on long term (2,000 years plus) history. 3. The IPCC climate models failed to predict the last decade of cooling. We're about to change the world based on these unproven models. 4. Sea level trends aren't doing what was predicted, or even what we've been told. 5. The "global warming signature" 10km above the tropics as predicted by the models can't be detected. There's no need to respond to these - it's been done before. I'm simply inviting others to check for themselves, and draw their own conclusions. >to do this are wrong, but that you know better than them! I made no such suggestion. Equally, there are thousands of scientists saying the opposite (including many previously associated with the IPCC and NASA), and you call them wrong. >chosen climate as the topic to try and take out of the hands of the experts? >Why not economic policy? Or trade? Because someone raised the question of climate here. I'm just responding. I'm trained to check whether facts fit an hypothesis. If they don't, or contradict it, then it remains an hypotheses of doubtful validity. Elevating to anything more (as our politicians are doing) is based on poor science. If scientists (or politicians) tell me that the sky has changed to green, and I look up and see blue, I simply won't believe them. >1. The whole basis of this is global temperature change. Bullsh!t. The whole basis of this is you don't want to take a financial hit to potentially help others. If doing something about CC was going to make you money, you would be screaming if something WASN'T being done, would you not? Why do we need to understand everything about CC before we do something? An excuse to rationalise the point above is my guess. Funnily enough there is an analogy. Keynes' economic theories overrode classical economic theory and now there are people out there saying that Keynes was wrong. We constantly make decisions that affect every element of society on flawed economic theories and the models that accompany them? And i have no doubt that these flaws have cost people lots of money. What's the difference? >I'm trained to check whether facts fit an hypothesis. >The temperature increase rate from 1910 - 1940 was the same as 1970 - 2000, even >though there was no significant anthropogenic CO2 at that time. will recieve resounding nods and cheers of applause. Even the macro and the submarine will get a warm reception. >>1. The whole basis of this is global temperature change. No, it really is all about global temperature (you may not have noticed). So are you saying you've looked at the long term trends (2,000 year plus) and believe you can see a difference in recent trends? With temperature going up and down, and higher in the past, I admire your keen eye. I don't think it really needs a stat analysis to see that recent temperature changes are nothing unusual. >2000, even >though there was no significant anthropogenic CO2 at that time. >the submarine will get a warm reception. You lost me on this one - what is the connection with macros and submarines?? Again, all I'm suggesting is that others grab the data and form their own opinions. Don't take anyone's word for it, including mine. One I forgot to mention was ocean temperature (currently dropping). Argo provides software that allows you to see plots and images of ocean temperature and trends, for those that want to see for themselves. http://www.argo.ucsd.edu/Marine_Atlas.html . It's about 400 meg download. What I want to see is the satellite data from 200 years ago. What, there isn't any? Hmm, which lot of data is more accurate? I can understand that anything that doesn't meet the current levels of accuracy can be be dismissed, both ways. What I can't get from anyone in this discussion is the answer to the question of; "Is the climate changing?". I say the answer is yes. What are the reasons? Many and varied. But I keep coming back to the question about when this started. As I mentioned in a previous post from New Scientist it was a question that Tyndall addressed himself to (it was a problem addressed by scientists before the "mini ice age" i.e. more than 200 years ago). Atmospheric gases have an impact on the climate, if they didn't, we wouldn't be here. We (humans) require a narrow band of conditions to survive, among these is a certain blend of gases in the atmosphere. Changing the mix of these gases, CFCs or CO2 or any other gas you care to mention will affect the climate. Any change will have an impact on the affect of 'solar rays', 'dipole' effects of the oceans, el nino and el nina, cloud cover etc. It is all interconnected and anybody who chooses to use isolated surveys, surveys over limited periods that contradict surveys over longer periods but somehow use both support a contrary view, is being selective and not scientific. The skeptics believe wholeheartedly that they are correct. The rest of the world is wrong and their half-baked arguments are proof that the rest of us are wrong. The deniers who post on this website refuse to contradict the arguments of those of us who rely on science. About 15 years ago one of the people I worked with, who was growing fruit at Upper Beaconsfield, and I both agreed that the climate was changing. We both thought that it was getting more 'tropical', warmer and more humid (he kept weather records for his property). Since then we have had a 12-13 year drought and the humidity that we were experiencing before then has been ameliorated. This is anecdotal evidence of a local nature, but somebody who is growing tropical fruit (nashi) was appreciating the change in a financial sense. But we were both in agreement that the climate was changing, this would have been predicated on the previous 5+ years. This is 20+ years ago and I know that the deniers will refute that the climate has changed in that 20+ years because they use figures that go back 8 months or maybe 8 years. They will also refute this 'data' because it is limited and local but then use data that is both local and limited to deny the changes that were being recorded on that particular property. They refuse to accept that local variations do not prove that the climate is changing, only that it is not getting warmer. I, like lots of others, are sick of the nonsense that they spruik and I promise to try and not respond in future. Now I'll go off and fondle the krabs and belay device that I just purchased from Aldi. And as a friend of mine is wont to say as he leaves after a long lunch: "You can all get stuffed". >isn't any? Hmm, which lot of data is more accurate? >of; "Is the climate changing?". Not worth even asking - of course it's changing - we all know that. These are very strange comments. I'm yet to come across anyone who doesn't agree that the global temperature has increased over the past 160 years by about 0.6 degC. Global warming isn't being questioned. It's simply a matter of what has caused this, considering that it's consistent with past changes, and actually expected. >Why do we need to understand everything about CC before we do something? 160 years ago man burnt a negligible amount of fossil fuels ... partly because the world population was less than 20% of what it is now. Fossil fuel burning skyrocketed after 1945. Only the past 64 years has relevance to any claims of fossil fuel burning causing warming. Of course the rate of temperature increase declined after 1945. >of temperature increase declined after 1945. Then what caused the temperature increase between 1910 and 1945 if it wasn't fossil fuel burning (which wasn't significant then)? Any chance it could have been the same cause for 1970 - 2000? Okay, so you plot some readily available data, and yet somehow you conclude the opposite to the major scientific bodies of the world. You assume you're right. Can you start with a definition of how you determine what constitutes Global Temperature? Average? What time of day do you take the measurements? What's the error in your plots? If a site reports range of 40-10 instead of 35-15 is that okay? Will every site in the world increase? Or does an increase in one place affect the temperature somewhere else, by changing flow patterns? If half the sites in the world show a 5deg increase and the other half show a 5 deg decrease is that okay? You've answered your own question here. PREDICTED consequence. It hasn't necessarily happened yet, but will if temperatures continue to rise. Also, check out what's going on with coastal properties at Byron Bay at the moment. Just because it's only risen 8mm in an enormous protected harbour, doesn't mean there aren't larger changes going on in other places. Will the changes in tide range be uniform absolutely, or will they increase the range by a % of the normal tide change? Will it only be an 8mm change on the north west shelf with thei 18m tide changes? My point is that you DO have to be a climate scientist to comment on this sort of stuff. I bet you can't answer with any certainty the questions I've raised. Nor can I. I don't pretend to either. Blaming global warming for beach erosion is just more alarmist nonsense, and convenient I guess for the Byron Bay council to use to pass the buck. It really is ridiculous but the media love it. As a land surveyor I've done plenty of title surveys involving high tide lines. The position of these high tide lines for beach front properties is well recorded for the last 100 years or more and its pretty common for the tide to advance 30-40 metres over this time. And this is in Corio Bay where there is no exposure to the ocean storms, its simply natural erosion from wind and waves. Happens everywhere. Harold, I didn't blame Global Warming for anything. All I pointed out was that despite the tide rising only 8mm at Fort Denison, there is plenty of evidence of changes in the tide in other places. That's it. How are BB council passing the buck? They haven't blamed global warming for anything, all they said was there's no point trying to fix this as the coastline does indeed move, as you so eloquently pointed out. Increased Greenhouse gas emissions have caused my bald patch. No, I agree with them - global temperature has increased over the past 100 years by about 0.6 degC (I've said this before). What I question is things like why was the rate of increase 1910 - 1940 (before heavy fossil fuel usage) was the same as 1970 - 2000, if CO2 is the driver. As for average temperature, I suggest you ask Hadley Centre, NASA (GISS), RSS, UHE etc. They are the ones processing and supplying the data. (GISS won't tell you) The method of determining the "average" temperature is a major discussion. eg should it be geometric or arithmetic etc. Steven Fielding is going to present Al Gore with a graph showing global average temperatures for the last 15 years. I'm sure the scales will drop from Al's eyes after that. Seriously, does anyone else worry about so much power being in the hands of a not so very bright happy clapper, who had a primary vote of around 2%? I think he also wants Intelligent Design theory to be taught in biology classes. That must create a conundrum for CC denialists who style themselves as champions of sound science. >average temperatures for the last 15 years. I thought this must have been a joke. "Hi Al, it's me Steven, from Australia. Oh you've heard of us? That's swell. Well, I've got this graph that shows temperatures for the last 15 years, you might not have thought of doing this, and see, the temperatures are going down! We were wrong all along!"